When you listen to the television reporters discuss Robin Williams, you will notice this thread of kindness. In Robin there was a general theme of care for other people. 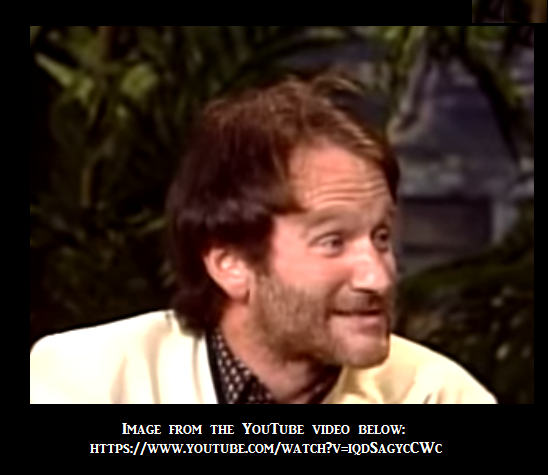 On CNN and other stations you hear that Williams was nice to everyone – other actors, reporters who interviewed him, cameramen and everyone around. You felt that he wanted to see people at ease. And, I feel that kind people have an inner hurt. It’s an empathy and even a rapport for the feelings of other people. We (I know this from experience) can hang onto this pain so we remember to treat other people well. We even create the pain within ourselves to continue that rapport. The inner hurt is a real pain within. Sometimes a person looks to drugs and alcohol to ease the pain. He’s kind to everyone outside of himself and he smiles. But inside he hurts. Sometimes it’s offers creativity to always, always find new way to be kind to others – making them laugh, making them smile, feel empowered or feel at ease. But there is always a deep power to please people. That is a continual inner resource. So, Robin was not a celebrity who didn’t give. He gave in a big way. And it was all consistent with the way he felt. It seemed to be that we are all one. We are equal. No one is beneath me. Robin Williams was one of the most giving stars. Comic Relief – began in 1986 with Billy Crystal and Whoopi Goldberg to raise money for America’s homeless. Earthquakes in Christchurch – In 2010 Williams gave 100% of the proceeds from his shows in New Zealand to the victims of the earthquakes. Previous articleKindness is a Choice and a Good One!